https://www.painfulpleasures.com/16g-steel-externally-threaded-straight-barbell-1-4-2.html?___store=1 4019 16g Externally Threaded Stainless Steel Straight Barbell https://cdnstoremedia.painfulpleasures.com/media/catalog/product/s/b/sb002.jpg 2.99 2.99 USD InStock /Body Jewelry/Straight Barbells /Body Jewelry/Straight Barbells/Surgical Steel Straight Barbells /Body Jewelry/Eyebrow Rings /Body Jewelry/Straight Barbells/Micro Straight Barbells /Body Jewelry/Eyebrow Rings/Surgical Steel Eyebrow Rings /Body Jewelry/Industrial Barbells /Body Jewelry/Straight Barbells/Straight Industrial Barbells 16g, 1/4”-2” Externally Threaded Straight Barbell This 16g (1.2mm) straight barbell is available in various sizes, from 1/4” (6.0mm) through 2” (50mm). The two steel balls thread onto the 1.2mm external threading at both ends of the barbell. 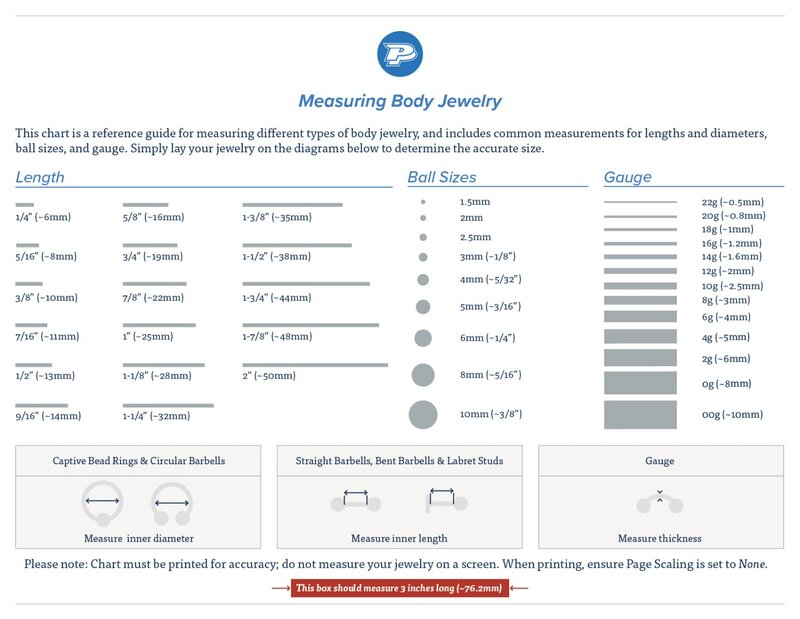 The balls are available in both 3mm and 4mm. 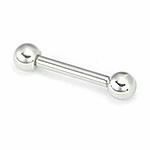 These barbells are crafted from 316L ASTM F-138 Implant Grade Stainless Steel making them a great option for a variety of piercings. Specifications: Gauge: 16g ~1.2mm Length: 1/4” (6.0mm) through 2” (50mm) Material: 316L ASTM F-138 Implant Grade Stainless Steel Thread Pattern: 1.2mm external Ball Size: 3mm or 4mm Priced per 1 USD 4020 16G STEEL EXTERNALLY THREADED STRAIGHT BARBELL 1/4" - 2" - 11mm ~ 7/16" - 3mm ~ 1/8" 2.99 2.99 https://cdnstoremedia.painfulpleasures.com/media/catalog/product/s/b/sb002.jpg OutOfStock 11mm ~ 7/16" 3mm ~ 1/8" 4021 16G STEEL EXTERNALLY THREADED STRAIGHT BARBELL 1/4" - 2" - 32mm ~ 1-1/4" - 3mm ~ 1/8" 2.99 2.99 https://cdnstoremedia.painfulpleasures.com/media/catalog/product/s/b/sb002.jpg InStock 32mm ~ 1-1/4" 3mm ~ 1/8" 4022 16G STEEL EXTERNALLY THREADED STRAIGHT BARBELL 1/4" - 2" - 14mm ~ 9/16" - 4mm ~ 5/32" 2.99 2.99 https://cdnstoremedia.painfulpleasures.com/media/catalog/product/s/b/sb002.jpg InStock 14mm ~ 9/16" 4mm ~ 5/32" 4023 16G STEEL EXTERNALLY THREADED STRAIGHT BARBELL 1/4" - 2" - 16mm ~ 5/8" - 4mm ~ 5/32" 2.99 2.99 https://cdnstoremedia.painfulpleasures.com/media/catalog/product/s/b/sb002.jpg InStock 16mm ~ 5/8" 4mm ~ 5/32" 4024 16G STEEL EXTERNALLY THREADED STRAIGHT BARBELL 1/4" - 2" - 44mm ~ 1-3/4" - 3mm ~ 1/8" 2.99 2.99 https://cdnstoremedia.painfulpleasures.com/media/catalog/product/s/b/sb002.jpg InStock 44mm ~ 1-3/4" 3mm ~ 1/8" 4025 16G STEEL EXTERNALLY THREADED STRAIGHT BARBELL 1/4" - 2" - 16mm ~ 5/8" - 3mm ~ 1/8" 2.99 2.99 https://cdnstoremedia.painfulpleasures.com/media/catalog/product/s/b/sb002.jpg InStock 16mm ~ 5/8" 3mm ~ 1/8" 4026 16G STEEL EXTERNALLY THREADED STRAIGHT BARBELL 1/4" - 2" - 11mm ~ 7/16" - 4mm ~ 5/32" 2.99 2.99 https://cdnstoremedia.painfulpleasures.com/media/catalog/product/s/b/sb002.jpg InStock 11mm ~ 7/16" 4mm ~ 5/32" 4027 16G STEEL EXTERNALLY THREADED STRAIGHT BARBELL 1/4" - 2" - 10mm ~ 3/8" - 3mm ~ 1/8" 2.99 2.99 https://cdnstoremedia.painfulpleasures.com/media/catalog/product/s/b/sb002.jpg InStock 10mm ~ 3/8" 3mm ~ 1/8" 4028 16G STEEL EXTERNALLY THREADED STRAIGHT BARBELL 1/4" - 2" - 19mm ~ 3/4" - 4mm ~ 5/32" 2.99 2.99 https://cdnstoremedia.painfulpleasures.com/media/catalog/product/s/b/sb002.jpg InStock 19mm ~ 3/4" 4mm ~ 5/32" 4029 16G STEEL EXTERNALLY THREADED STRAIGHT BARBELL 1/4" - 2" - 50mm ~ 2" - 3mm ~ 1/8" 2.99 2.99 https://cdnstoremedia.painfulpleasures.com/media/catalog/product/s/b/sb002.jpg InStock 50mm ~ 2" 3mm ~ 1/8" 4030 16G STEEL EXTERNALLY THREADED STRAIGHT BARBELL 1/4" - 2" - 35mm ~ 1-3/8" - 4mm ~ 5/32" 2.99 2.99 https://cdnstoremedia.painfulpleasures.com/media/catalog/product/s/b/sb002.jpg InStock 35mm ~ 1-3/8" 4mm ~ 5/32" 4031 16G STEEL EXTERNALLY THREADED STRAIGHT BARBELL 1/4" - 2" - 25mm ~ 1" - 3mm ~ 1/8" 2.99 2.99 https://cdnstoremedia.painfulpleasures.com/media/catalog/product/s/b/sb002.jpg InStock 25mm ~ 1" 3mm ~ 1/8" 4032 16G STEEL EXTERNALLY THREADED STRAIGHT BARBELL 1/4" - 2" - 28mm ~ 1-1/8" - 3mm ~ 1/8" 2.99 2.99 https://cdnstoremedia.painfulpleasures.com/media/catalog/product/s/b/sb002.jpg InStock 28mm ~ 1-1/8" 3mm ~ 1/8" 4033 16G STEEL EXTERNALLY THREADED STRAIGHT BARBELL 1/4" - 2" - 38mm ~ 1-1/2" - 3mm ~ 1/8" 2.99 2.99 https://cdnstoremedia.painfulpleasures.com/media/catalog/product/s/b/sb002.jpg InStock 38mm ~ 1-1/2" 3mm ~ 1/8" 4034 16G STEEL EXTERNALLY THREADED STRAIGHT BARBELL 1/4" - 2" - 10mm ~ 3/8" - 4mm ~ 5/32" 2.99 2.99 https://cdnstoremedia.painfulpleasures.com/media/catalog/product/s/b/sb002.jpg InStock 10mm ~ 3/8" 4mm ~ 5/32" 4035 16G STEEL EXTERNALLY THREADED STRAIGHT BARBELL 1/4" - 2" - 48mm ~ 1-7/8" - 4mm ~ 5/32" 2.99 2.99 https://cdnstoremedia.painfulpleasures.com/media/catalog/product/s/b/sb002.jpg InStock 48mm ~ 1-7/8" 4mm ~ 5/32" 4036 16G STEEL EXTERNALLY THREADED STRAIGHT BARBELL 1/4" - 2" - 50mm ~ 2" - 4mm ~ 5/32" 2.99 2.99 https://cdnstoremedia.painfulpleasures.com/media/catalog/product/s/b/sb002.jpg InStock 50mm ~ 2" 4mm ~ 5/32" 4037 16G STEEL EXTERNALLY THREADED STRAIGHT BARBELL 1/4" - 2" - 22mm ~ 7/8" - 4mm ~ 5/32" 2.99 2.99 https://cdnstoremedia.painfulpleasures.com/media/catalog/product/s/b/sb002.jpg InStock 22mm ~ 7/8" 4mm ~ 5/32" 4038 16G STEEL EXTERNALLY THREADED STRAIGHT BARBELL 1/4" - 2" - 13mm ~ 1/2" - 4mm ~ 5/32" 2.99 2.99 https://cdnstoremedia.painfulpleasures.com/media/catalog/product/s/b/sb002.jpg InStock 13mm ~ 1/2" 4mm ~ 5/32" 4039 16G STEEL EXTERNALLY THREADED STRAIGHT BARBELL 1/4" - 2" - 41mm ~ 1-5/8" - 3mm ~ 1/8" 2.99 2.99 https://cdnstoremedia.painfulpleasures.com/media/catalog/product/s/b/sb002.jpg InStock 41mm ~ 1-5/8" 3mm ~ 1/8" 4040 16G STEEL EXTERNALLY THREADED STRAIGHT BARBELL 1/4" - 2" - 38mm ~ 1-1/2" - 4mm ~ 5/32" 2.99 2.99 https://cdnstoremedia.painfulpleasures.com/media/catalog/product/s/b/sb002.jpg InStock 38mm ~ 1-1/2" 4mm ~ 5/32" 4041 16G STEEL EXTERNALLY THREADED STRAIGHT BARBELL 1/4" - 2" - 32mm ~ 1-1/4" - 4mm ~ 5/32" 2.99 2.99 https://cdnstoremedia.painfulpleasures.com/media/catalog/product/s/b/sb002.jpg InStock 32mm ~ 1-1/4" 4mm ~ 5/32" 4042 16G STEEL EXTERNALLY THREADED STRAIGHT BARBELL 1/4" - 2" - 8mm ~ 5/16" - 4mm ~ 5/32" 2.99 2.99 https://cdnstoremedia.painfulpleasures.com/media/catalog/product/s/b/sb002.jpg InStock 8mm ~ 5/16" 4mm ~ 5/32" 4043 16G STEEL EXTERNALLY THREADED STRAIGHT BARBELL 1/4" - 2" - 13mm ~ 1/2" - 3mm ~ 1/8" 2.99 2.99 https://cdnstoremedia.painfulpleasures.com/media/catalog/product/s/b/sb002.jpg InStock 13mm ~ 1/2" 3mm ~ 1/8" 4044 16G STEEL EXTERNALLY THREADED STRAIGHT BARBELL 1/4" - 2" - 25mm ~ 1" - 4mm ~ 5/32" 2.99 2.99 https://cdnstoremedia.painfulpleasures.com/media/catalog/product/s/b/sb002.jpg InStock 25mm ~ 1" 4mm ~ 5/32" 4045 16G STEEL EXTERNALLY THREADED STRAIGHT BARBELL 1/4" - 2" - 22mm ~ 7/8" - 3mm ~ 1/8" 2.99 2.99 https://cdnstoremedia.painfulpleasures.com/media/catalog/product/s/b/sb002.jpg InStock 22mm ~ 7/8" 3mm ~ 1/8" 4046 16G STEEL EXTERNALLY THREADED STRAIGHT BARBELL 1/4" - 2" - 8mm ~ 5/16" - 3mm ~ 1/8" 2.99 2.99 https://cdnstoremedia.painfulpleasures.com/media/catalog/product/s/b/sb002.jpg InStock 8mm ~ 5/16" 3mm ~ 1/8" 4047 16G STEEL EXTERNALLY THREADED STRAIGHT BARBELL 1/4" - 2" - 19mm ~ 3/4" - 3mm ~ 1/8" 2.99 2.99 https://cdnstoremedia.painfulpleasures.com/media/catalog/product/s/b/sb002.jpg InStock 19mm ~ 3/4" 3mm ~ 1/8" 4048 16G STEEL EXTERNALLY THREADED STRAIGHT BARBELL 1/4" - 2" - 41mm ~ 1-5/8" - 4mm ~ 5/32" 2.99 2.99 https://cdnstoremedia.painfulpleasures.com/media/catalog/product/s/b/sb002.jpg InStock 41mm ~ 1-5/8" 4mm ~ 5/32" 4049 16G STEEL EXTERNALLY THREADED STRAIGHT BARBELL 1/4" - 2" - 44mm ~ 1-3/4" - 4mm ~ 5/32" 2.99 2.99 https://cdnstoremedia.painfulpleasures.com/media/catalog/product/s/b/sb002.jpg InStock 44mm ~ 1-3/4" 4mm ~ 5/32" 4050 16G STEEL EXTERNALLY THREADED STRAIGHT BARBELL 1/4" - 2" - 48mm ~ 1-7/8" - 3mm ~ 1/8" 2.99 2.99 https://cdnstoremedia.painfulpleasures.com/media/catalog/product/s/b/sb002.jpg InStock 48mm ~ 1-7/8" 3mm ~ 1/8" 4051 16G STEEL EXTERNALLY THREADED STRAIGHT BARBELL 1/4" - 2" - 35mm ~ 1-3/8" - 3mm ~ 1/8" 2.99 2.99 https://cdnstoremedia.painfulpleasures.com/media/catalog/product/s/b/sb002.jpg InStock 35mm ~ 1-3/8" 3mm ~ 1/8" 4052 16G STEEL EXTERNALLY THREADED STRAIGHT BARBELL 1/4" - 2" - 28mm ~ 1-1/8" - 4mm ~ 5/32" 2.99 2.99 https://cdnstoremedia.painfulpleasures.com/media/catalog/product/s/b/sb002.jpg InStock 28mm ~ 1-1/8" 4mm ~ 5/32" 4053 16G STEEL EXTERNALLY THREADED STRAIGHT BARBELL 1/4" - 2" - 14mm ~ 9/16" - 3mm ~ 1/8" 2.99 2.99 https://cdnstoremedia.painfulpleasures.com/media/catalog/product/s/b/sb002.jpg InStock 14mm ~ 9/16" 3mm ~ 1/8" 4054 16G STEEL EXTERNALLY THREADED STRAIGHT BARBELL 1/4" - 2"-6mm ~ 1/4"-3mm 2.99 2.99 https://cdnstoremedia.painfulpleasures.com/media/catalog/product/s/b/sb002.jpg InStock 6mm ~ 1/4" 3mm ~ 1/8" 4055 16G STEEL EXTERNALLY THREADED STRAIGHT BARBELL 1/4" - 2"-6mm ~ 1/4"-4mm 2.99 2.99 https://cdnstoremedia.painfulpleasures.com/media/catalog/product/s/b/sb002.jpg InStock 6mm ~ 1/4" 4mm ~ 5/32"